I don't think in terms of history about that series. I think in terms of contemporary life. It was such a part of me that I didn't think of something outside. It was like I was doing a portrait of something. If it was a portrait, it was a portrait of myself, a portrait of my family, a portrait of my peers. By the time I started work on the (Migration Series), I was more conscious of what I wanted to do. I was looking consciously at things and for things. Lawrences Migration Series depicts the migration of African Americans from the rural South to the urban North during and after World War I. The Great Migration was the largest movement of black people since slavery removed Africans to the Americas. Lawrences sixty panels portray the story of people seeking a better life. The captions for each image combine history, sociology, and poetry in a visual narrative. The railroad is the link in the series of events that comprise Lawrences epic story. The narrative cycle begins and ends with images of a train station. In the first panel, African Americans embark on their journey from the South to the North, through time and geography, conflict and hope. Scenes of the train station are repeated throughout the series ending with the text "And the migrants kept coming." In the first half of the series, the South is depicted as a bleak, rustic landscape where social inequities and injustice prevailpoverty, hunger, segregation, lynching, and discrimination are commonplace facts of life. Some scenes are portrayed as if seen from a moving train; the North appears only as names of train destinations. In contrast to the environment of the South, the second half of the narrative depicts the buildings, people, and industry of the urban North. The final section of The Migration Series focuses on the new African-American communities of the Norththe positive effects of improved social conditions as well as the ensuing conflicts of overcrowding and race riots. 1. Jacob Lawrence: The Migration Series, The Phillips Collection, Washington, D.C., 1993-94. 2. 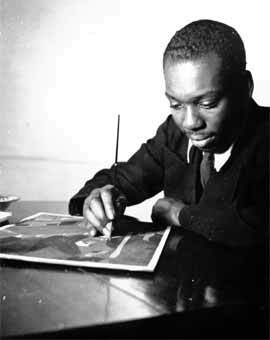 Elizabeth McCausland, "Jacob Lawrence," in Ellen Harkins Wheat, ed., Jacob Lawrence: American Painter (Seattle: University of Washington Press in association with the Seattle Art Museum, 1986), p. 60.